Residential Landscaping, lawn mowing /maintenance, landscape design, stonescapes, ponds, walls, walkways, patios, etc. in Dublin, Ga.
As a homeowner and a consumer, your life is chock-full of choices, all day, every day. But they don’t all have to be difficult decisions. Ice cream? Ben and Jerry’s. A one-stop shop saves you time, money, and hassle. Being a full-service residential landscape provider means we design it, grow it, build it, and maintain it. We can handle all of your needs. Count on a name you can trust. Simmons Landscaping Services for the last ten years has been a family and friend based business who's foundation lies on God and honest quality work. We make no compromises on the quality of our landscaping work, and we stand by that work once it’s finished. Our reputation as a landscaper depends on it. If it is value you seek, it is value we will deliver. 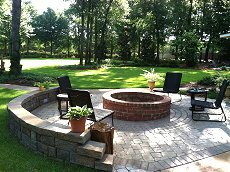 AtSimmons Landscaping Services we are committed to helping customers make great use of their investment in us, bringing the highest professional and performance standards to every residential landscaping project, no matter the budget. Take a small example: a tree. With Simmons Landscaping Services a tree is more than just a tree. You get a beautiful, healthy tree, hand-crafted at our nursery. You get a knowledgeable landscape designer showing you which variety of tree to plant where. You get the expertise and attention to detail of the Simmons landscape crews who are installing your tree. You get a full warranty, and most importantly, you get the kind of customer service MasterCard would call “priceless.” Dollar-for-dollar, Simmons Landscaping Services offers you the best landscape value on the market. It’s fun to be a “raving fan”. That’s the term we have for customers who just go nuts for our service. They write long thank-you letters, invite us to their children’s weddings in their new back yard, name their first child after us. (Okay maybe not that last part :-) People often hire us because they trust our company and we offer a fair price. But they keep coming back because of the experience they had with our people. We fully intend to wow you with our service and make you our next raving. Testimonials available upon request. The decision to landscape is a big one, and we understand the importance of researching and getting all the facts before deciding which landscaper you want to trust to do the job right. We have a list of several of our past residential customers who are willing to be contacted to discuss their experiences. If you would like speak to any of them, you can contact us via or Contact Us page or call our office at (478) 279-1232 and we can put you in touch with them.